Hi friends! It's Sunday and that means time for a new challenge at The Paper Players. 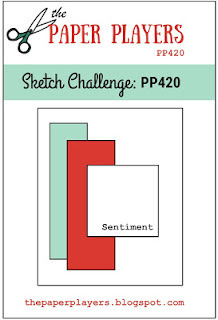 This week I have the pleasure and honor of being your hostess with a sketch challenge. 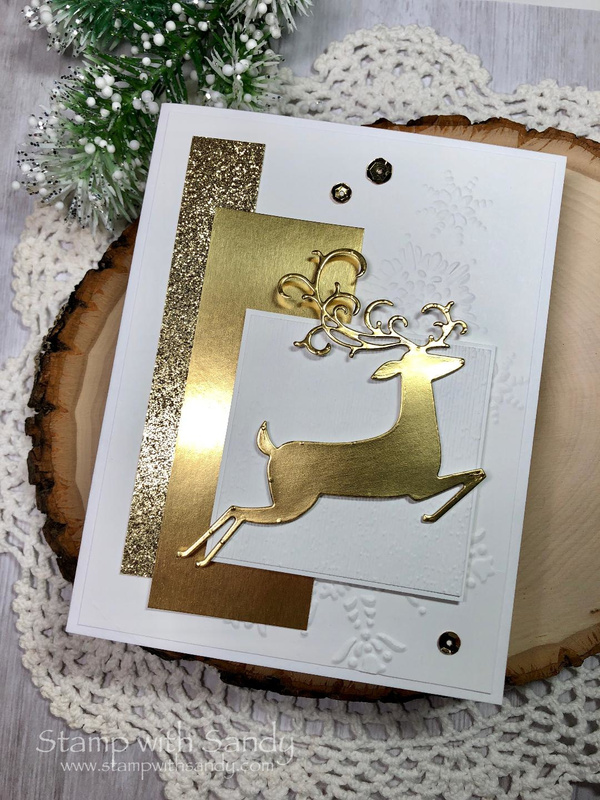 I'm in full-on Christmas card making mode now, and I was inspired to make a card in gold and white, one of my favorite combos for holiday cards. No stamps or ink were used, just dies cuts and embossing. I saved my sentiment for the inside. The shimmer of the glitter paper and gold foil are very pretty in real life! Thanks so much for stopping by! Please leave a comment, and then head over to visit the rest of the Design Team at The Paper Players. I hope you'll play along with our challenge this week, too! OOOOhhhh very elegant. I do like this card very much. I'm not much of a colorer and there is no coloring. I do admire those that have that gift. Gorgeous my dear!! I really like cards with no stamping! Glad you do too! HUGS! Sandy, I have to tell you that I really enjoyed your sketch this week. It’s totally going into my “favorites” file because you know how I feel about layers. Ha! Your Christmas card is beautifully elegant. All of that shimmer and sparkle is perfectly paired with the embossed background. So pretty! Wow! Absolutely stunning, Sandy! This is one of my all-time favorite deer die cuts, and you have showcased it perfectly. LOVE it...and your fabulous sketch! Sandy, I loved your sketch and I love this card. The golden deer is amazing. I'm so glad that I have this set too and can't believe it wasn't my first choice! The various textures of gold bring it to life. Fabulous! Sandy...gold and sparkle are my FAVORITE combination for the holidays. So loving your card... I am tingly inside! Sandy your card is just stunning! 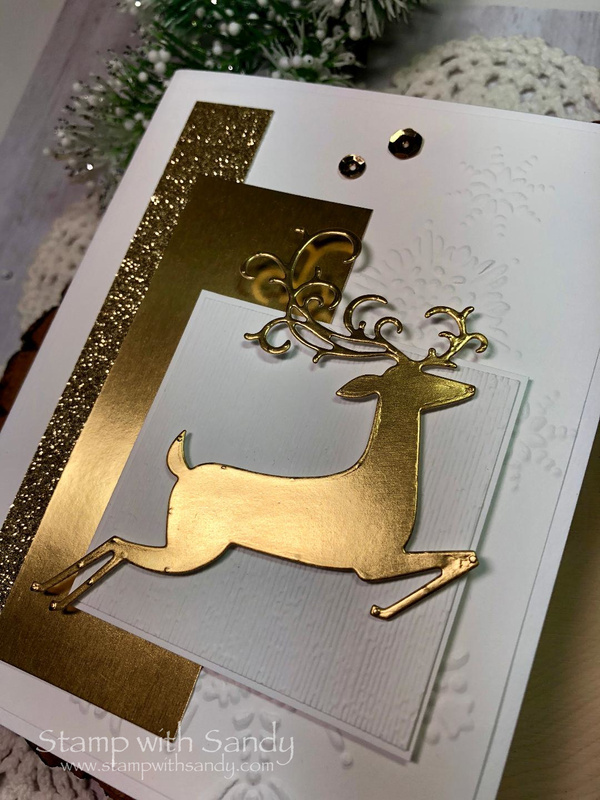 I love the white and gold combo and the contrast of smooth and texture with the foil, glimmer paper and embossed snowflakes. 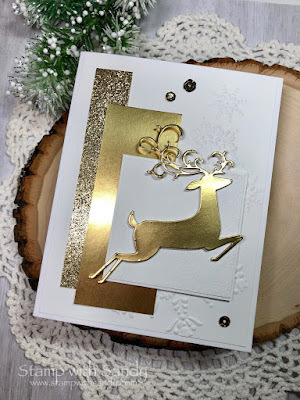 The deer is so elegant - a beautiful card! Great sketch too! So elegant Sandy! I love the gold!